In this chapter, I trouble the “path” that defines who we are in relation to places. I explore how the imaginations of place define what bodies might become. I look at how taken-for-granted understandings of place, as a container ready to be filled in, act upon us to normalize and anticipate positions for ourselves and others. This understanding of space as occupied by things, identities, meanings, and practices (Massey, 2005) confines the self as someone we already know. To orient oneself to space in predefined ways or to inhabit spaces as already oriented (Ahmed, 2006) reproduces social and cultural imaginations. 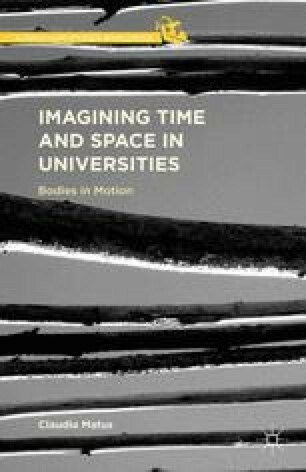 In this respect, Doreen Massey (2005) comments, “So easily this way of imagining space can lead us to conceive of other places, peoples, cultures simply as phenomena ‘on’ this surface … They lie there, on space, in place, without their own trajectories” (p. 4). … and in a month or so I’ll sometimes fall asleep with the sound of whales moving about in the bay, they blow through their air holes, and breath in the cool night air, and soon I’m hoping for an iceberg to drift by. We usually get a few passing by, some have come in on the wind and got stuck on the bottom of the bay … The bay is very deep … I’m blessed to have such a place … I don’t know of another place to anchor myself but next to an ocean. The light can be very moving (Email from a participant, May, 2006).